IRVINE, California - KP Performance Antennas, an Infinite Electronics brand, and an industry-leading manufacturer of wireless network antennas, has unveiled a brand new 900 MHz, 10dBi, ±45 slant dual-polarized omni antenna for use in outdoor fixed wireless applications. This new omni-directional antenna from KP operates in the 824-928 MHz frequency range and provides uniform, 360-degree coverage with minimal azimuth ripple and 10 dBi of gain. It supports any 900 MHz access point radio (AP), including the popular Cambium® PMP450i™ radio for point-to-multipoint installations. 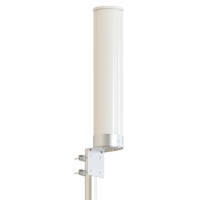 This new 900MHz omni antenna has 15-degree elevation beamwidth and is able to penetrate dense foliage with 900 MHz, dual ±45-degree slant polarization. The antenna comes with robust mounting hardware and is available to ship the same day. KP’s new 900 MHz omni antenna is in-stock now and can be ordered directly from KP’s authorized distributors or from the KP Performance Antennas website at https://www.kpperformance.com/900mhz-10dbi-dual-pol-45-slant-omni-antenna-kp-900-dpoma-45.